This is the 2nd part of the Powegen conference coverage. 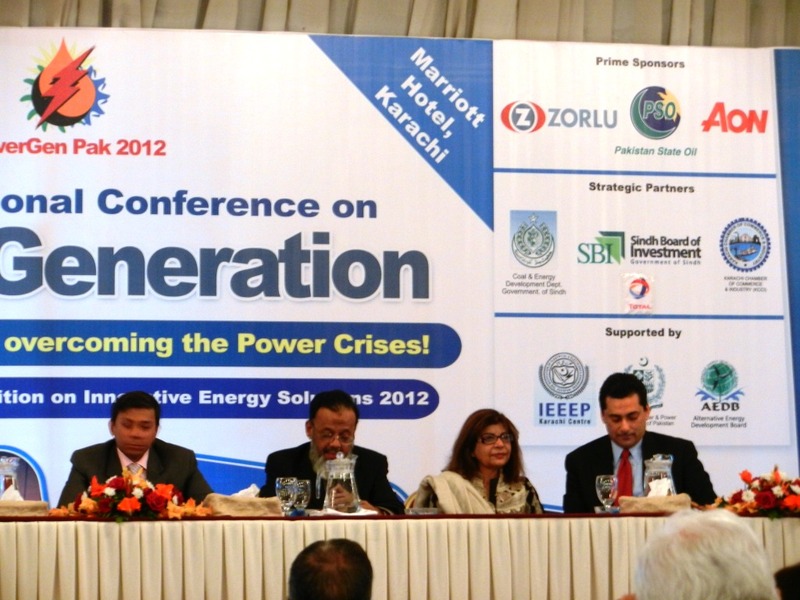 The 5th International Power Generation Conference & Exhibition 2012 was held at Marriott, Karachi on the 2nd of February with the agenda ‘Future Energy Mix in Overcoming the Power Crisis’. 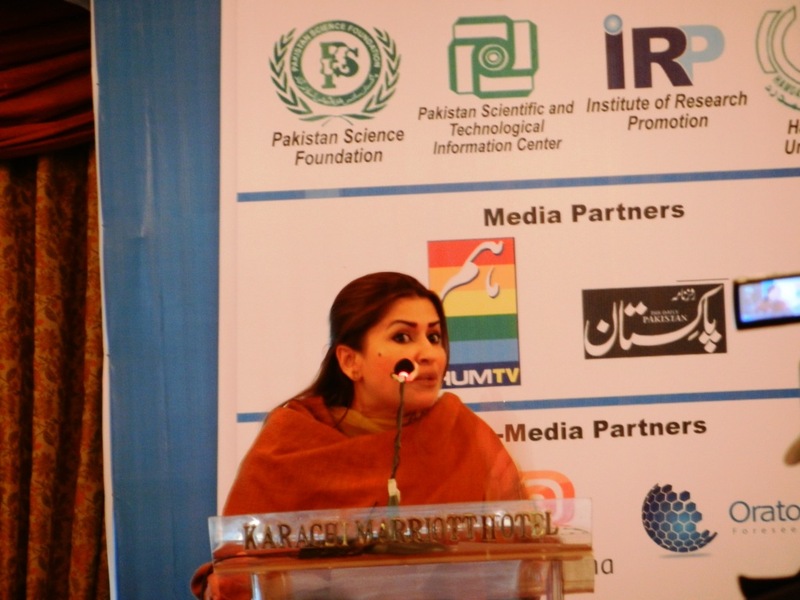 It was a star-studded event with speeches and presentations from Manzoor Soomro- Chairman Pakistan Science Foundation (PSF), Mian Abrar Hussain, President Karachi Chamber of Commerce, Dr. Tilo Klinner – Consul General Germany, Nasim Khan VC Hamdard University, Saigan Sharif – Additional Secretary of Ministry of Science & Technology, Qazi Kamal – Chairman Fuel, Gas, Power Sub-SITE Association, Tahir Saleem – Chairman IEEE, Zubair Motiwala – Chairman Board of Investment Govt. 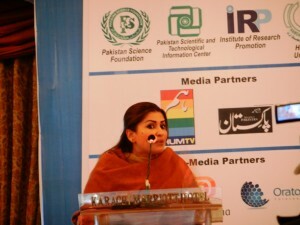 of Pakistan, Naeem Qureshi – Managing Editor Energy Update, Shazia Marri – Minister for Electric Power Sindh, Junaid Qureshi – CEO SSJD, Faisal Qureshi – CEO 24/7 Online TV, Abdullah Muhammad Yousuf – Chairman IPP’s Advisory Council, Rukhsana Zuberi – Chairperson women in energy, Shaaf Mehboob – CEO Adoptive Solar. We need a system where people listen to each other’s point of view and learn from it. Democracy provides this feature. When I used to sit in opposition during Musharraf government, he used to reject any point raised against Kalabagh dam and was hell-bent on making that dam. Kalabagh dam will provide only a fraction of our energy needs and so much time and money has been wasted arguing about it which could have been utilized in some useful way. The difference between this government and the previous is that we are willing to listen to everyone and diligently work towards coming up with a workable solution acceptable to all. Ghazi Barotha project producing 1450MW of power in an environment friendly. 3,000 MW added during this government’s tenure. 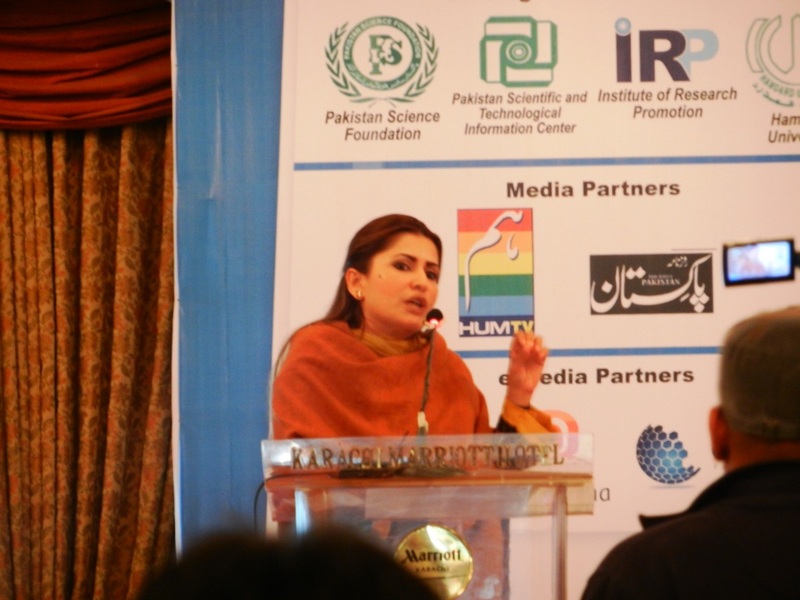 Sindh’s target for 2012 is to have 10% of contribution from alternative sources: wind, solar and biomass. Power station under process in Nooriabad. Sugar distilleries are an ideal source of biomass. Austrian company working on a wind power project to be completed by March 2013 which will contribute 500-800MW. The total demand in 2011 was 19,400 MW which will swell to 50,000MW by 2022. Wind energy costs 13-15 cents per KWH whereas biomass costs 11-13 cents/KWH. While wind energy projects become feasible after 50MW, biomass are feasible in the range 1-50MW. A 15MW project needs 1,730,000 tons of biomass, the source of which can be a number of things, sugar molasses, animal waste etc. Sugar cane produces 11-13% of the main product and 60% of biomass. Rs. 322 Mn Revenue/year is possible. If 2000 MW of electricity is generated through biomass, it would result in savings of Rs.57 Bn/year and $1 Bn/year saving in imported oil. The plant would have to be nearer to the biomass source in order to minimize the huge cost of transporting thousands of tons of the material. In addition it would need a steady supply of water. The ideal place for the plant would be rural whereby villagers can aid in the supply of biomass and get benefited from the plant as well. Public sector is the biggest consumer of electricity. Solar geysers are a great energy saver. I’ve one installed in my home and my gas bill remains the same in both winter and summer. The circular debt has ballooned to Rs.400 Billion. With this much money, 1600MW of energy could have been generated by installing a solar-powered plant. It costs approximately Rs.200,000 to produce 1KW of electricity through solar power. You’ve been listening to enlightened views from learned people the entire day and there’s nothing more I can add that can surpass those insights except the fact that there’s a chandelier over my head with over 40 bulbs each at least 40 watts and it’s been on the entire time. If people in this room cannot see this waste of energy, then I’ve got nothing to say. 30 years ago hydel source contributed 70% of total power requirement whereas thermal only 30%. The trend has reversed now with thermal contributing 70% and hydel 30%. Government is giving Rs.200 Bn subsidy on electricity while it can only afford Rs.80 Bn. That means government is having a deficit of Rs.120 Bn added to it. Rs.26 Million is the penalty charges to the government for non-payment of dues on time by PEPCO. Rs.350 Bn are the receivables owed to WAPDA. Energy crisis costs 2-3% GDP loss. $15 Bn was the furnace oil import bill last year. $32 BN is the expected bill this year. 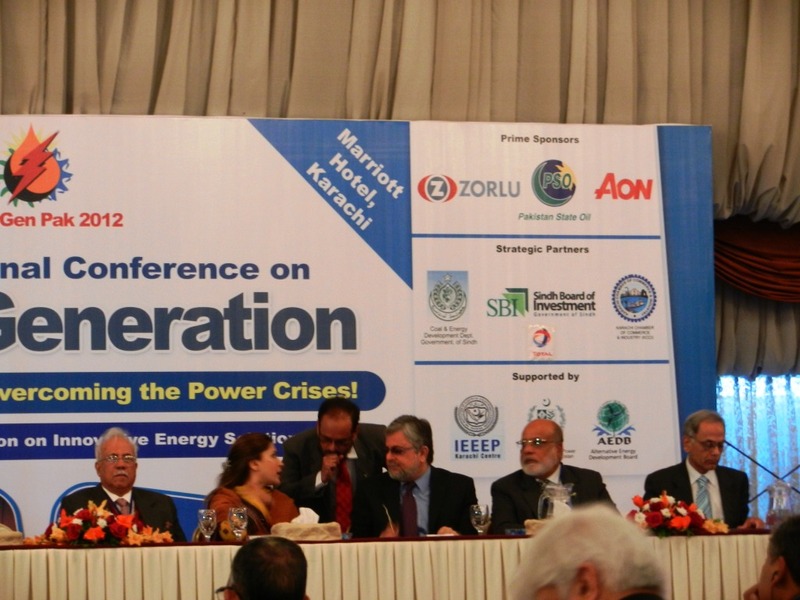 It was a thought-provoking conference on the energy problems beset by Pakistan and the gravity of the situation. However, this sort of discussion is pertinent to a conference that is being held for the first time. For a conference that is in its fifth year and still not able to generate a viable solution that is embraced by the four main stakeholders: government, consumer, industry and research institutes, that reflects poorly on our state of affairs. Sure, there were many solutions proposed. But then these solutions have been proposed since God knows when. What we need now is one solution acceptable to all which alleviates at least some of the nation’s suffering. And that this conference was unable to come up with in spite of having the brightest minds present.